The sea on the south coast of Cornwall is less rough away from the Atlantic Ocean, more suited to family seaside holidays rather than surfing. 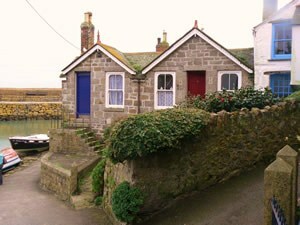 Many a family rents a cottage for a holiday in Cornwall and makes the most of their 2 weeks break by the sea. Sounds like a member of the reptile family but is in fact a beautifully placed village on the Lizard Peninsula, the UK's extreme southern point. It's name has nothing to do with lizards but derives from the Cornish for high place (lis = place and ard = high). Historically it is known as the place where in 1588 the Spanish Armada was first spotted. Anyone wanting to enter the English Channel knows Lizard Point as a difficult place to maneouver and history can vouch for it claiming many a life. To reduce these fatalities the distinct two tower Lighthouse was built in 1752 and it's light can be seen for 26 nautical miles and is Cornwall's oldest light. Since 1998 it has been an automated lighthouse. 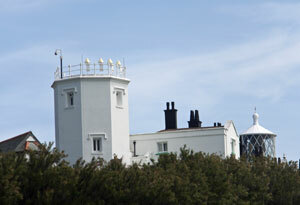 There is now a Heritage Centre in the lighthouse which is open to the public and is worth visiting if only for the unforgetable experience of seeing the inside of a lighthouse. Anyone visiting in a large vehicle should bear in mind that they will need to leave their vehicle in the village and walk the mile or so to the lighthouse. 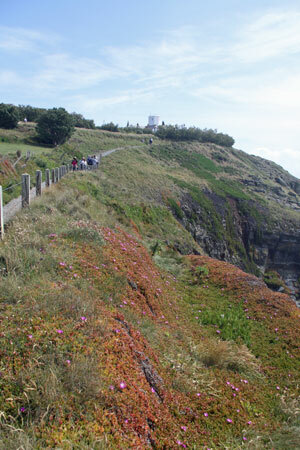 See it as an opportunity to look at the wonderful scenic views and flowers. The presence of the RNLI is essential here in keeping the area safe for shipping and going to rescue when plans turn sour. Go along to their latest lifeboat station is at Kilcobben Cove and was built in 1961. A Tyne class lifeboat called David Robinson ON1145 has been based there since 1988. In the village itself there are lots of amenities related to tourism such as shops, a pub and cafes. St Winwallo's parish church is worth a look. It is made of the local serpentine stone of which you will spot other items around the village. Another place to visit is the Lizard Marconi Wireless station site where the Marconi company carried out it's famous wireless experiments back in the 1900 relating to ship-shore radio. There is a museum where you can see the equipment that was used and hear about the history. Beach lovers will not be disappointed as 2 miles north of Lizard there is Kynance Cove said to be a most beautiful beach. Unfortunately for beach lovers who are also dog lovers no dogs allowed during main tourism season. Looe Town is made up of two towns, East Looe (the larger) and West Looe situated on either side of the River Looe. They are connected up by a Victorian era built bridge with seven arches. This is Looe's third bridge and it replaced a stone one which had St Anne's Chapel in the middle. The original 1411 built bridge was wooden but was destroyed by fire. Looe is a popular town for seaside holidays with plenty of beaches in Looe and nearby. In East Looe there is a nice sandy beach alongside the Banjo Pier. Although concentrating mainly now on the tourist industry the fishing industry in Looe is still very active. Tourists to the town can look forward to good fresh fish meals in the town's many restaurants. Angler visitors to Looe have the choice of shark, mackerel or conger fishing trips and for those who prefer river fishing there is Looe Lake. Watersports and sailing enthusiasts will not be disappointed with the activities on offer. The best place to start is Looe Sailing Club. For the super active there is an extreme and adventure centre in Looe which offers absailing, rockclimbing, windsurfing and other adventure sports. For those wanting to become a PADI certified scuba diving training Looe is the place. There are a number of golf course within reach including Looe's own 18 hole, 70 par course. Between them East and West Looe have a wide range of shops, restaurants and pubs to keep most tourists happy. Don't forget to taste the pasties as the ones in Looe have a reputations for being very good. Walkers will be interested to hear that the famous South West Coastal Path passes the village. In fact there is lots of scope for pleasant walks in and around East and West Looe. While in East Looe take a look at its 1500 century Old Guildhall and the museum which now resides there. For those still with time on their hands there is the Woolly monkey sanctuary which is doing wonderful work with Woolly and Capuchin monkeys and Barbay Macaques which is worth a visit. If all that is still not enough also worth a visit is St George's Island more commonly known as Looe Island, a short boat ride away. It used to be popular with smugglers but is now a sanctuary for sea and woodland birds. The island has beautiful views and a very mild climate - mild enough for daffodils at Christmas. The Island is looked after by the Cornwall Wildlife Trust to whom it was bequeathed in 2004 by the Atkins sisters and forms part of the Looe Voluntary Marine Conservation Area. Last but not least, it is tradition in Looe to dress in fancy dress on New Year Eve and head out in the town. That is probably why Looe is reputed to be one of the best places in UK to spend New Year's Eve. 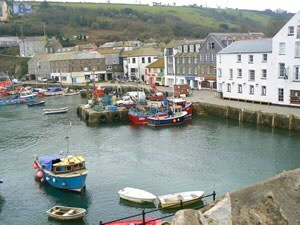 Mevagissey is a small very picturesque fishing port and village situated in a valley about 6 miles from St Austell. Once the heart of Cornwall’s pilchard industry it is still a working fishing port. The village is at harbour level and accessible by foot and car. Buses connect the village with St Austell. Along the narrow streets you will find shops, galleries, craft workshops, restaurants and bars. In the summer months there is a passenger ferry from Mevagissey Harbour to Fowey where the Daphne Du Murier Festival takes place each year. There are also fishing trips for those who prefer to try and catch their own fish. Take a walk along the slopes of the surrounding hills and test your stamina whilst looking at the interesting angles at which the locals’ houses are built. How some of their parked cars do not finish up in the harbour is beyond belief. There are a few that have doors in their roofs and the higher you go the better your photos of the two harbours will be. There is a range of restaurants and pubs all serving good food at prices to suit all pockets. What visit to a Cornish fishing port would be complete with a plate of fish and chips or a lovely Cornish pasty. For those looking for something to take back home to remind them of Cornwall there are a number of craft workshop and shops selling good quality souvenirs much made by local artisans. If you have a sweet tooth do not fail to visit Gillard’s old fashion sweet shop for those old favourites like milk bottles, sherbet lemons, gobstoppers and the like. Beach lovers can enjoy the nearby beaches and coves of Goran Haven, Pentewan, Portmellon and Vault Beach. Mevagissey is a fine place for a day trip (but leave your car in the car park 100 metres away) or equally to make as your base for visits to both Eden and Heligan. The latter can be reached by foot although your buys from the Plant Shop at Heligan might make your journey home an exhausting one if you do. The locals are very friendly and service is always with a smile so it is a place you will want to visit more than once. Mousehole is a very pretty fishing village with well preserved fisherman cottages built of Lamorna granite lining its small winding streets. The village itself is built like many in the area around its harbour.In the case of Mousehole the harbour protects the village from the extremes of weather. 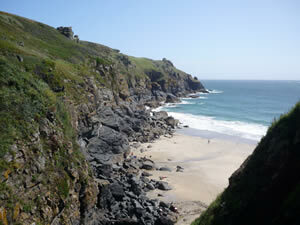 For those with young children there is a well sheltered beach perfect for them to play. 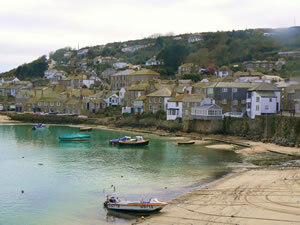 Nowadays Tourism is Mousehole’s main industry but some fishing boats still remain and can be seen in the harbour. The modern Mousehole originates from 1595. It is still possible to see the Keigwin Arms the only building that survived the attack on Mount’s Bay by Spaniard Carlos de Amésquita. The building is now a private dwelling and was saved from destruction by it’s then owner Squire Jenkyn Keigwin who died defending it. There is now a Plaque to this effect on the wall. Mousehole is next door to Newlyn and its famous Newlyn Art Community. Therefore it is fitting that it should have some fine galleries. Visitors to Mousehole have an opportunity to view and possibly buy fine paintings or sculptures by local artists (some well known) in a friendly, easygoing environment. For those who love wondering around souvenirs shops there are good quality locally produced souvenirs to be had. 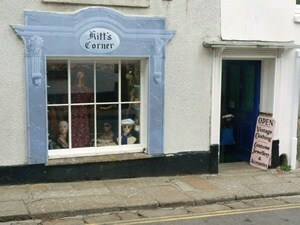 Along the pleasant winding streets there are many places to enjoy Cornwall’s famous pasties and clotted cream teas. Mousehole is the place for cat lovers. The cats are everywhere and they seem very happy so it is not surprising one resident Antonia Barber wrote a childrens’ book called the Mousehole Cat inspired by the Tom Bawcock Eve Festival tradition. Polperro is a 13th century fishing village known for centuries as a pilchard fishing and processing port. The pilchards are now gone but fishing is still one of the occupations of Polperro. Lying at the mouth of the River Pol it had a history for flooding but residents and tourists can now breath a sigh of relief. This vulnerability has now been reduced with work on the river channel to increases flow capacity, the construction of two flood relief tunnels and five dams. Tourists are drawn to this picturesque village with its winding narrow streets filled with all types of shops and quays covered in fishing nets and pots laid out by incoming fishermen. So what is there in Polperro for the visitor? Well firstly there are plenty of beautiful walks. In fact the South West Coast Path (Dorset to Somerset) a 630 mile walk (for serious walkers) first used by revenue officers searching for smugglers, passes the village. For those who prefer a guided walk along the coastline these are also on offer in Polperro. For those interested in sea angling there are boat trips from Polperro, which is home to the Shark Angeling Club of Great Britain. There are also boat trips for those who want to view the coastline and maybe get a glimpse of a dolphin or shark. Trips to Looe and Fowey are also available. Still on the subject of water there is a scuba diving facilities in Polperro and a small beach. There are a number of good restaurants/inns so an opportunity to relax while someone else does the cooking and enjoy good fresh fish dishes. Some inns also put on live entertainment so look out for these while on the spot. Despite a long history of smuggling and association with Zephaniah Job, the smugglers banker, the only connection to smuggling now to be found in the village is the Polperro Heritage Museum of Fishing and Smuggling. Or if you happen to visit Polperro on New Year's Eve you will find many of the villagers have turned into pirates! Look out for the very coastal looking Shell House in Wren - a house very beautifully decorated with shells. For those who like choirs look out for renditions by the Polperro Fishermen's choir. They give concerts most Wednesday evenings throughout June, July and August and also at christmas. They were formed in 1923 and have appeared in Songs of Praise. Lastly, being a small village there is a limit to the number of cars that can be fitted in so visitors are asked to leave their cars in the car park just outside the village, unless they have made prior arrangements. From there it is a healthy 3/4 mile walk or a pretty horse bus or tram ride. Nearby Liskeard is the place to go for all the excitment of Go-Karting and Quad riding. If this isn't wild enough Bodmin Moor is within easy reach. River fishing, golf (18 hole, par 70), watersports and extreme sports (climbing, abseiling etc) are available in neighbouring Looe. For many centuries St Austell was synonymous with mining. From the 18th century it was clay mining which is still evident from the many disused clay pits around. One of these disused pits has been famously and successfully turned into the Eden Project. A couple of miles outside the town there is also the China Clay Country Park where tourists can have fun and learn about the industry. 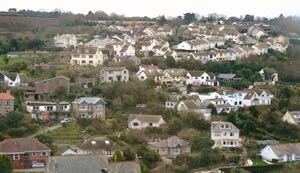 St Austell town caters well for its large population the largest of any town in Cornwall. People from all the villages around utilise the large shopping area which will be increase further in October 2009 with the opening of White River Place. The latter complex as well as shops will add a 4 screen cinema, bars and the ever necessary parking spaces. Tourists will be pleased to hear that there are plenty of entertainment and leisure facilities such as: restaurants, pubs, clubs, cinemas, swimming pools, bowling, squash and badminton courts, childrens entertainment centres. Don't leave St Austell without tasting the St Austell beer and visiting the brewery. For the culturally minded there are many art galleries/studios in and around the centre of town and in Charlestown. There is also a couple of theatres. Students of architecture will recognise the many examples of the work of Cornwall's most famous arhitect Silvanus Trevail of the 19th century. Not to be missed is Charlestown, St Austell's still working Georgian port and it's harbour built around 1791. It was built to handle the forwarding of ore and clay around the world. In the harbour you will see some of the tall ship fleet of the Square Sail Company. There is also the attraction of Charlestown Shipwreck Rescue and Heritage Centre which has the Heart of Ocean necklace worn by Kate Winslet in Titanic. On the subject of film, the tv series Poldark was filmed here. For those who find themselves with time on their hands there are many attractions within easy reach such as the Lost Gardens of Heligan, Eden Project, various fine beaches, and villages such as Fowey and Mevagissey which are accessible by bus. St Austell is easily reached by road or by rail. It is on the Penzance to London line and there is also a connection to the North of England Scotland. Truro stated out as a Celtic Village and is now known as Cornwall’s Cathedral City. It gained its city status courtesy of Queen Victoria on 8th August 1877. It is said, although not everyone agrees, that the name Truro comes from the Cornish Tri-veru meaning three rivers. These being the rivers Kenwyn and Allen that lead into the River Fal. In the 14th century Truro was a wealthy fishing area and also one of Cornwall’s 5 stannary towns. The Cathedral itself was designed by John Loughborough Pearson in Gothic Revival style. It has some very fine Victorian stained glass. Edward VII laid the foundation stone while still Prince of Wales in 1880. It was built in the grounds of a 16 century church St Mary the Virgin. Truro got its first bishop Edward White Bension in 1877. Modern day Truro still has many of the beautiful Georgian town houses built by wealthy mine owners in Truro’s prosperous 18th and 19th century when tin prices were at a height worldwide. Lemon Street is said to be one of the UK’s best examples of Georgian architecture and in fact many of the buildings, which are in Bath stone, were designed by Silvanus Trevail the distinguished Cornish Architect. On the outskirts of Truro can be found many beautiful parklands such as Pencalenick, Trelissick Garden and Tregothnan. There is also an area designated to be of outstanding natural beauty, Calenick Greek plus a Nature Reserve alongside the River Allen.